Don Juan comes back home a war hero only to find that his girlfriend/cousin Blanca is to marry the evil Don Ramiro in order to stop a war between Ramiro and her father, Don Francisco. Juan and Blanca decide to elope and are caught and Juan is banished from the land! 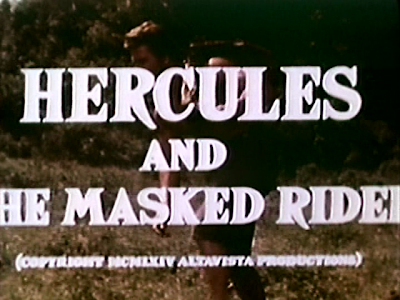 He ends up getting mixed up with some crazy gypsies, and among the gypsies walks Hercules! The best thing about this movie is that they don't explain why Hercules is there. Did he travel forward through time, arriving in 16th century Spain? Is he just some guy named Hercules (a very common name in Spain, back then)? The film doesn't tell you and you are left to decide on your own; the hallmark of a good film. So I thought Don Juan would become Zorro or something, but he looks as much like Zorro as he does the Lone Ranger or the Green Hornet or any guy whose costume is just whatever he was wearing that day with a tiny mask over his eyes. But he does ride around and get into a lot of sword fights and even cuts one guys pants, causing them to fall down, comically exposing his hilarious olde tyme underwear. 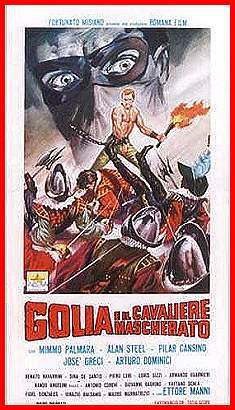 This is pretty much your typical Italian Hercules muscleman movie. The bad guy is totally evil and cowardly and the good guys are so good they won't even kill guys that are trying to kill them. The problem is there isn't much of anything going on in this movie and even the constant fight scenes are pretty boring and do nothing to keep your interest. This is the first movie in the Warriors 50-movie set and I am hoping it is just a poor choice because I don't think I can take forty-nine more of these!